Aero-Model is expanding their selection of 30C and 65C Lithium Polymer chemistry Batteries. Driven by the popularity of multi-rotor aircraft and the number of mid-sized sport aircraft available, they have recently developed four new high capacity battery packs. 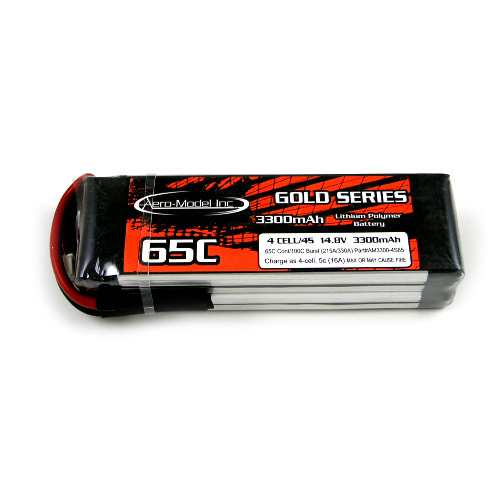 Aero-Model’s 30C “Silver Series” and 65C “Gold Series”now include 3 Cell 3300mAh, 4000 mAh, 5000 mAh, and 4 Cell 5000 mAh sizes. These battery product lines emphasize excellent value and also provide reliable, consistent power output and outstanding cycle life. Aero-Model has been developing industry leading electric power systems, used in both competition and general sport flying, for over a decade and has drawn on this experience to develop a line of quality battery packs that are designed to meet and exceed pilots expectations and provide outstanding performance, quality and value.